You can find this section under Interface Translations > Small Translations in the IRP Admin left navigation menu. Use the search bar to find any small translations. If you expand Other Options under the search bar you can filter by Translation Category, by Language, by universal ones only (specific to your website only), by non-universal ones only (common across all IRPs) or by all small translations. You can also find any small translations that are missing a translation in a particular language. ID: This is the unique IRP identifier of the small translation. Category: This is the Translation Category associated with the small translation. English: This shows the English version of the small translation. Foreign Translations: This is where you can add small translations in other languages. Other Info: This shows any additional information related to the small translation. As with many other pages in IRP Admin, you can click the Download icon between the Search bar and the main grid to export the small translations in a format of your choosing. After making changes to Small Translations, or adding new ones, it is a good idea to reload them into memory by clicking the Reload the Translations button at the top of the screen. Go to Interface Translations > Small Translations in the IRP Admin left navigation menu. Click the Add New Small Translation button at the top of the screen. Translation Small ID This is the unique IRP identifier for this translation. This is added automatically by the IRP. Content Type in the content of the translation. Universal Check this box if the translation is universal across all websites running on the IRP platform. Otherwise leave this unchecked if the translation is specific to your website. Translation Category Select a Translation Category from the drop-down list. Usage Context Enter an example of the context in which the translation is used. Notes Enter any Admin Notes for this Translation. This can be used to provide additional information relating to this translation within the IRP Admin. Click the Insert Small Translation button to save the details. Use the Search bar to find the Small Translation that you want to edit. 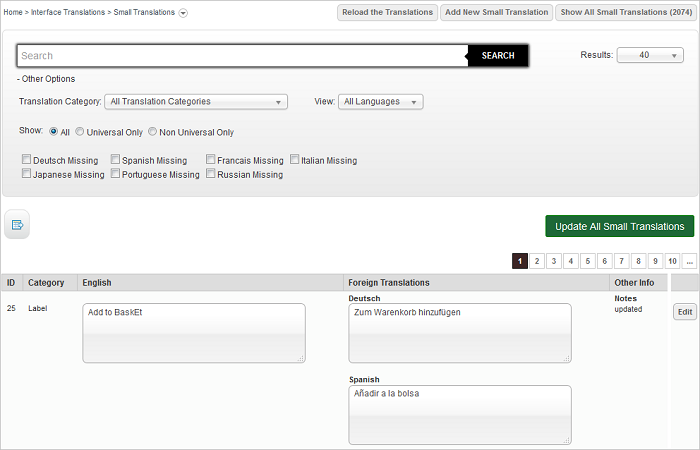 Expand Other Options under the Search bar to see more filter options to help you locate the right Translation. Alternatively, if you know the ID number of the Small Translation, enter it in the Quick Find search bar at the top of your IRP Admin screen and select ‘Translation Small’ from the drop-down menu. Click beside the translation you want to change.